We hear a lot about the importance of Science, Technology, Engineering and Math (STEM) to our global economy. We are told that STEM is where the jobs are now and where job growth will be in the future. Chmura Economics & Analytics estimates STEM jobs to grow 18% in Virginia by 2024—nearly double the growth for non-STEM fields. This is why it is important to inspire middle and high school students to pursue Hot STEM careers. Whether it's the next cure for cancer, better food supplies or the next generation of communication - all of the solutions to the world's problems will involve STEM. Among the fastest growing industries in the U. S., STEM jobs are vital to our economy and to our global competitiveness. By 2018 the majority of STEM jobs in the U.S. will be in Computing (71%), followed by traditional Engineering (16%), Physical Sciences, (7%), Life Sciences (4%) and Mathematics (2%). Source: US Bureau of Labor Statistics. Virginia ranks 5th in the U.S. for number of projected STEM jobs - 404,000 by 2018. A pretty impressive ranking that closely follows 1) California, 2) Texas, 3) New York and 4) Florida. The federal government, our educational systems, and business and industry leaders are investing a great deal of time and money trying to find solutions to this problem. Parents want to help their children discover their interests and strengths so they can work toward careers that offer opportunities. How can we improve our children's education to prepare them for the future workforce? What jobs are expanding in Virginia and what training is needed for students to be successful? What will the Hot STEM Jobs of the future be in Virginia? Science Matters has embarked on “Hot Shots & Hot Jobs” to explore these questions. “Hot Shots & Hot Jobs” features videos of young professionals as role models in innovative STEM jobs in Virginia. The videos are featured on the Science Matters’ website with an article explaining the skills and training needed and current job opportunities in Virginia. We want parents, teachers and career counselors to use this material to inspire middle school and high school students to pursue Hot STEM careers. Health Research & Development/Consumer Products: Making our Daily Vitamins Effective and Tasty! The project is grounded in extensive research conducted by numerous organizations including the U.S. Bureau of Labor Statistics, The Brookings Institute, Chmura Economics & Analytics and reports by Bridging RVA a regional partnership connecting education to college and career readiness strategies. All of the data was studied through the lens of the unique strengths and needs of Central Virginia. Viewing the videos with your child to see what ignites their interest. Explore the links and "dig deeper" into the questions that arise. Take your family to all of the exciting hands-on STEM events in our community. Check out the Science Matters Community Events calendar for events not to miss. 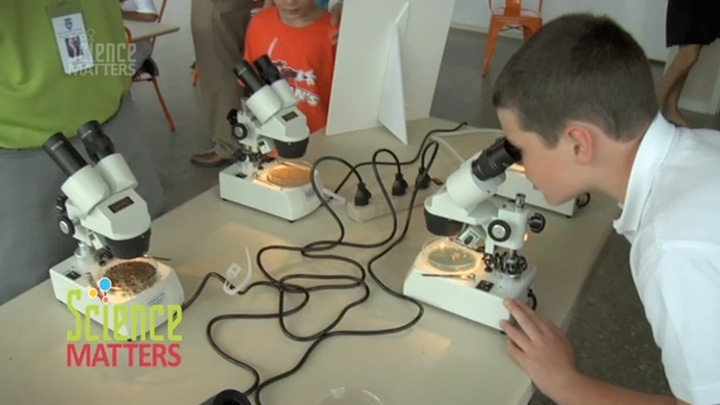 Get involved in Citizen Science projects and help scientists do research all over the world.